Last Tuesday, AJ Styles won two matches to become the number one contender for the US Title. Then, on Friday at a live show at Madison Square Garden, Styles beat Owens to become the new US Champ. The new US Champ, AJ Styles, heads to the ring. He says that this moment isn’t about himself or Kevin Owens, it’s about the US Title and what it will represent. He mentions Cena’s US Title open challenge and says that it’s time to bring back it back. The AJ Styles Open Challenge starts right now. After a few moments John Cena’s music plays and he heads to the ring. Cena first makes sure that Styles realizes what he just said. He meant open to everyone but Cena, right? Styles responds by saying no, it’s open to everyone including Cena. Cena then accepts the challenge and Charles Robinson heads to the ring. The announcement for the match is made, but before the opening bell can ring Kevin Owens comes out and interrupts. He says that no one wants to see another stupid Cena versus Styles match. The only thing people should care about is Owens getting the US Title back. He wonders why Cena is back since no one missed him and no one wants to see him. Cena says it’s not that Owens doesn’t want to see him, it’s that he can’t see him. He tells Owens to make him leave. As he’s talking, Rusev enters the ring and attacks. Owens joins the brawl, leaving both Cena and Styles down on the mat. This wasn’t that great. There wasn’t anything wrong with it, but it was very uneventful. Dillinger barely got any offense, but it also felt like Mahal barely got any either. It’s a very forgettable match. Mahal gets on the mic after the match and says that he is going to bring Hell to Randy Orton. Next week in SmackDown Live, Mahal is bringing the Punjabi prison with him. A pretty good match, but pretty short. I liked how the ref handled the shenanigans at ringside, and I liked the finish. I just wish there was more. But as it is, it’s a perfectly fine match as a promo for the upcoming tag title match. Naomi asks Shane McMahon who she will defend her title against next. Before he can answer, Charlotte, Becky Lynch, Natalya, Lana, and Tamina walk up. Shane says there will be a fatal five way match at Battleground to determine who will face Naomi at Summer Slam. The women start to argue, so Shane makes a tag match for tonight to let them get some of their aggression out. The five challengers walk off, but Carmella walks up with a petition to reinstate James Ellsworth. Shane looks at the petition then tears it up. Carmella doesn’t like that. Renee Young welcomes Baron Corbin. Corbin says he’s afraid of what he’s going to do to Shinsuke Nakamura tonight. He then tries to rhyme “sayonara” with “Nakamura.” Corbin laughs. Renee doesn’t. Shinsuke Nakamura heads to the ring for a match. Baron Corbin comes out next, but Nakamura attacks him before he can get to the ring. The two brawl in the crowd and at ringside until some referees, Adam Pearce, and Jamie Noble manage to separate them. Cena tells Styles he’s still going to accept the open challenge when he can. Styles says he knew Cena would be the first to accept and he wants to face him. Cena respects that and says they’ll deal with the US Title later. Tonight, Cena has Styles’ back in their tag match. Styles says he has Cena’s as well. Cedric Alexander says that tonight he will finally end the situation with Alicia Fox and Noam Dar by making Dar quit in an I Quit match on 205 Live. Good match. There were some shenanigans with Lana coming down to ringside, but it worked will within the match. This was a nice tag bout. Maria Kanellis asks Chad Gable if he’s seen Sami Zayn. He hasn’t. After a commercial break, Maria and Michael Kanellis demands an apology from Sami Zayn. Zayn says he’s already apologized, and he’s not even sure why he’s apologizing. He’s also unsure if Michael is a competitor on the SmackDown roster. Maybe it’s Maria who’s the fighter and Michael who’s the lover. Michael responds by smashing a glass vase over Sami’s head. Breezango presents an episode of “Runway Walker Texas Rangers” in which they attempt to lasso Zack Ryder. They fail and Breeze winds up tangled in his own lasso of truth. Mojo walks up and wonders what he has walked into. Breezango question the Hype Bros about attacking Breeze, but their answer devolves into an argument about Mojo throwing Ryder out of the US contender match last week. Breezango decides to ride back to their office, but Fandango’s stick horse has been stolen! Probably by ghost aliens. Good match. 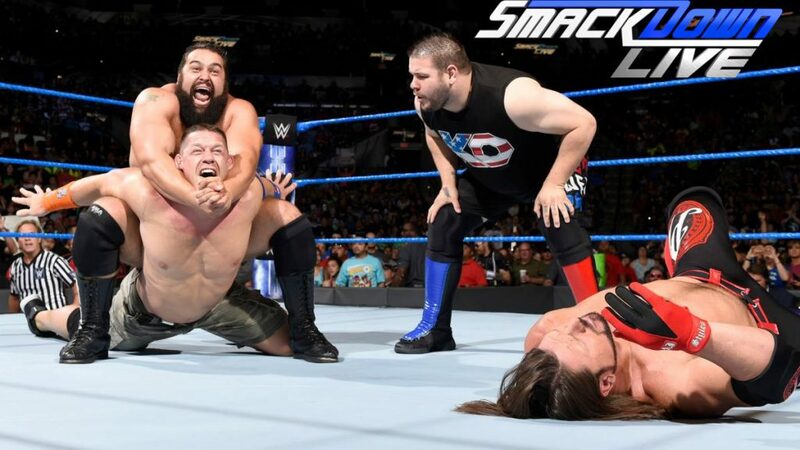 Cena started the match, but Styles got the tag pretty quickly and got isolated by Owens and Rusev. It was a straightforward tag match, but it was entertaining. This show was fine, but it was clearly a show meant to set up the PPV. Not a whole lot happened on this show, but some matches got made and I quite enjoyed the Breezango segment (as usual). If not for Styles winning the US Title at a live event though, this show might be pretty forgettable. A US Title match between Styles and Cena probably would have been a better match, but this made sense considering Battleground is less than two weeks away. The match was good, and it was interesting to see Cena and Styles work together. Also, the rest of the matches on this show were pretty short, so this kind of wins by default.